Deed Book C, page 358, Logan County Clerk’s Office, Logan, WV. This deed identifies the ten children of John and Chloe (Farley) Dingess, Sr. Harvey S. Dingess is my great-great-great-great-grandfather. The property referenced in the deed is located in present-day Chapmanville, Logan County, WV. John Gore (1816-1895), son of Joseph and Martha (Pine) Gore. Husband to Margaret “Peggy” Dingess. Settled on the West Fork of Harts Creek in Logan County, WV. John Gore Land Grant (1848), Logan County, (West) Virginia. John Gore obituary, Logan County Banner (Logan, WV), 9 October 1895. 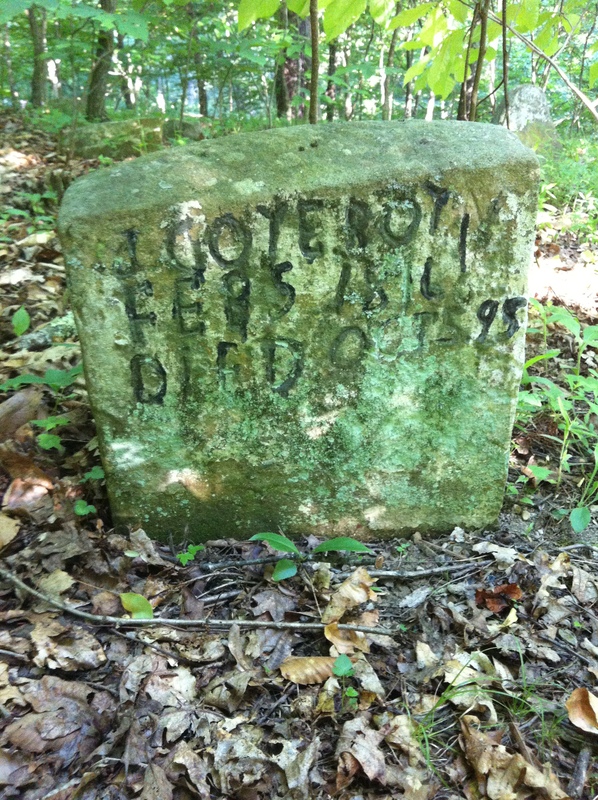 John Gore grave, West Fork of Harts Creek, Logan County, WV. 5 June 2015. 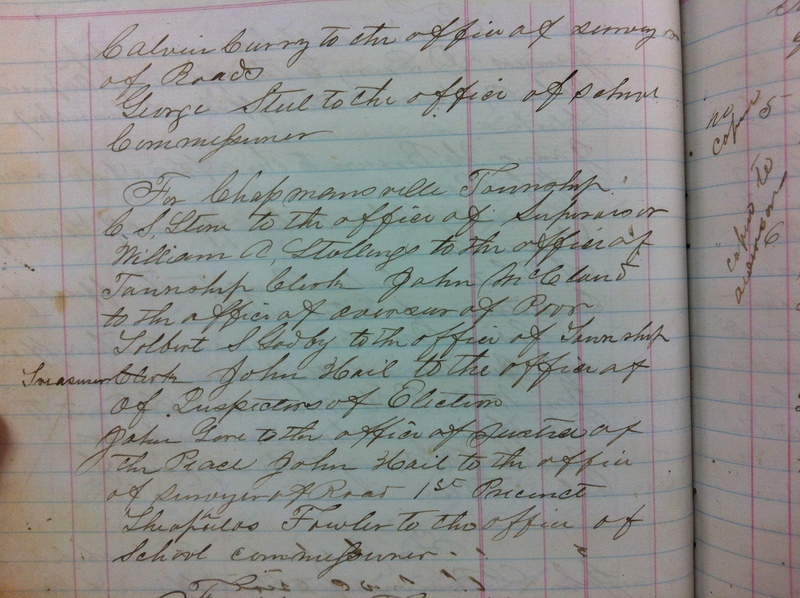 Chapmanville Township officers elected 22 October 1868, November 1868. Commissioners Record Book 1 (p. 112), Logan County Clerk’s Office, Logan, WV. NOTE: This year, two log school houses were “neatly and substantially gotten” up in Harts Creek District. NOTE: Total youths in county (2771); total students (2199); average daily attendance for county students: 47 percent. NOTE: I spelled names as they were spelled in the record. Listed below are land grants and early deeds citing the Harts Creek and Big Ugly Creek areas of what was then Logan and Cabell counties, Virginia. The list will be updated and improved periodically. 1843 James White, Jr. N/A Rockhouse? Ed Haley’s grandfather, Andrew Jackson Mullins, was born about 1843 to Peter and Jane (Mullins) Mullins. Jackson, as he was called, was named in honor of President Andrew Jackson, that early American icon. Like many folks in those days, Peter and Jane Mullins appear to have been caught up in the Jackson mystique. They even named one son Van Buren, after his vice president. Jackson Mullins was the first child born to Peter following the family exodus from Kentucky or Tennessee to Logan County, (West) Virginia. The 1850 Logan County Census listed him as seven years old. In 1860, he was eighteen. During the Civil War, Jackson served in the Confederate army. Brothers Weddington and Van Buren served as Confederates. In the late 1860s, Jackson married the slightly older Chloe Ann (Gore) Adams, a widow. Chloe had been born around 1840 to John and Margaret (Dingess) Gore, pioneer residents of Harts Creek. She had first married John Quincy “Bad John” Adams, a first cousin to Jackson, with whom she had four children: Dicy (born 1857), Joseph (born May 1858), John C. “Frock” (born c. 1861) and George Washington “Ticky George” (born 15 Jul 1864). She and Jackson had three children: Imogene Mullins (born c.1868), Peter Mullins (born May 1870), and Weddington Mullins (born April 10, 1872). Jackson and Chloe are thought to have lived on Trace Fork, perhaps at the present-day site of the Turley Adams home where they certainly lived in later years. In March 1891, Jackson and Chloe Mullins deeded their property on Trace Fork to their three children: Imogene Haley, Peter Mullins, and Weddie Mullins. In the 1900 Logan County Census, Jackson gave his birth date as March of 1845, while Chloe gave hers as July 1834. Ed Haley first appears in the 1900 Logan County Census as “James E. Haley, born August 1885,” and living in their home. His birth date of 1885 was two years later than what was given by the Haley family records. By 1910, Jackson lived with son Peter Mullins, while Chloe was in the home of Weddie Mullins’ widow, Mag. Ed was absent from the census entirely, indicating that he was gone from Harts by that time. A few years later, in 1915, Jackson Mullins died and was buried in an unmarked grave at the Bob Mullins Cemetery on main Harts Creek. His widow died in 1919.